A few months ago, I posted this track, “Consuelo mio” by Orquesta Show Sinfonica Sunicancha Huarochiri. It’s still one of my favorite Pelanga songs, one I always try to sneak into rotation at a party. In Lima, I went in search of anything else by this group, and came across this: Los Ases de Huarochiri. This album is a bit different from the other one, Cumbias, Mambos, y Salsas al estio de mi tierra (can’t say the first one, since I don’t really know which came first…), more Andean, less tropical. Musically, it’s all over the map: polkas, huaynos, cumbias, tracks (like this one) that feature a lot of guitar, and even a few with an acoustic guitar, accordion and very little in the way of horns. Here’s a sample from side b. An added (non-musical) bonus: the third guy form the right looks exactly like my brother-in-law PJ. Maybe I’ll ask him which album came first, and why the band can’t decide on a style. This entry was posted in PELANGA RECORDS! 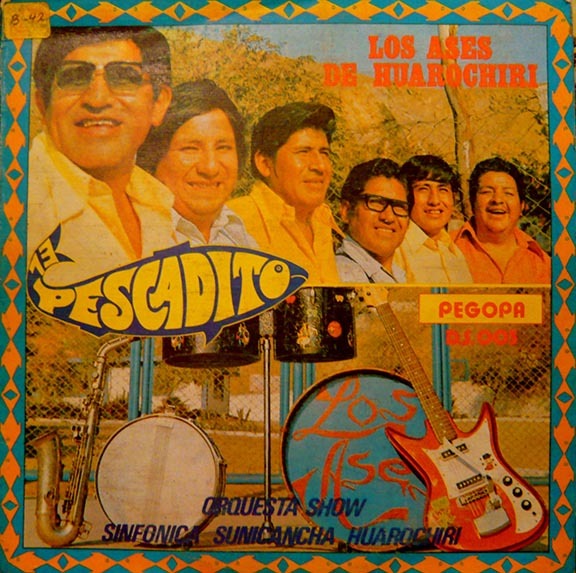 and tagged El Pescadito, Huarochiri, Orquesta Show Sinfonica Sunicancha, Peru by Franz Tunda. Bookmark the permalink. i’d say you gotta find room for this one too at the next pelanga. by the way, is it me or does this sound a lot like "lo mas sabroso"?